Entrance Fee: No entrance fee is present. But there are certain fees for the safaris as well as the overnight stay and cuisine at the camps. The Sam Sand Dunes in Rajasthan are easily the most stunning sites which should be visited around the stunning city of Jaisalmer. 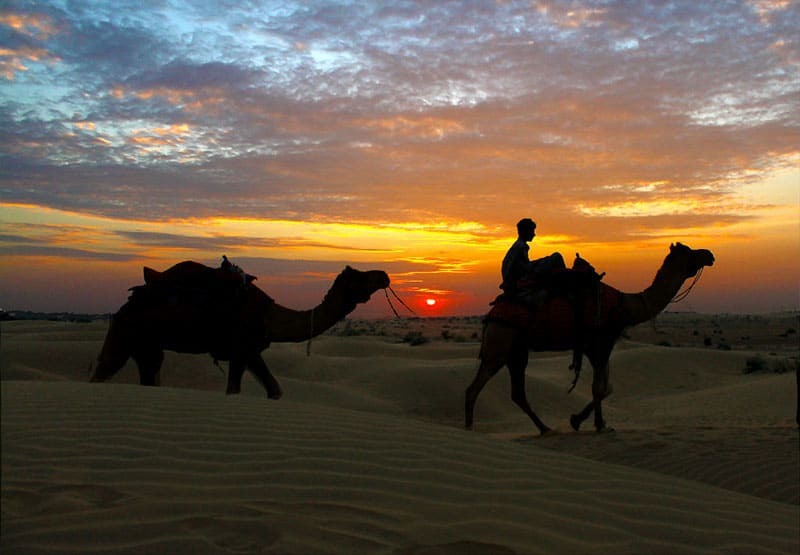 Present at about 40 kilometers away from Jaisalmer, the Sam Sand Dunes are popularly visited by all kinds of visitors for the soul-stirring experience that it offers right in the midst of the astounding Thar Desert. The spectacular dunes stretch for a length of about 2 kilometers and offer a breathtaking view with stress during the sunsets and sunrises. The location is quite popular for the varied activities which can be carried out. The camel rides and the stay overnight at one of the several beautiful tents which are put up there, complete the total experience of staying out at the vast desert under the starry sky. The local cultural programs which are arranged and the mouth-watering regional cuisine further add spice to the stay. Visiting the hot Thar Desert is better recommended to be accompanied with comfortable clothes and footwear. Avoid too much time out in the heat and try to plan an overnight stay to indulge in the best experience. The nights can get a little chilly and having extra clothes would be a good idea. Lay back and look up at the starry sky in the midst of the cool desert. Enjoy the amazing experience of camel riding through the camel safaris which are carried out around the area. Stay at one of the tents and enjoy the singing and dancing which are presented. Experience the authentic cuisines around some warm campfire with fellow travelers. Try out paragliding in the midst of the Thar desert which is at a small distance away from the dunes. Click some stunning panoramic pictures of the core of the desert and the magnificent dunes. The camel owners act as the guides throughout the camel rides and after that during the overnight stay at the inviting tents, the hosts shower the guests with their hospitality. The cooler months of October to March are better to visit this location. But even in the hot summer, the temperature dips quickly after sunset. The months of February and March is when the festive spirit of the region catches on and some really good music and dance can be expected. Most of the hotels offer packages which include transport to the dunes. Otherwise an own vehicle can be used. There are not many options of public transport to this place as most people prefer jeep safaris through the well-maintained roads. The naturally formed sand dunes are because of the winds which blow over the sands. The shape of these dunes keep changing in accordance to the wind intensity and direction. There is a plethora of adventure activities like paragliding, parasailing and paramotoring for people who want to fly like a bird above the sands and look down at the sparse and scenic desert which spreads around. Quad biking and jeep safaris are other thrilling activities which can be carried out on the sandy desert. The desert triangle of Rajasthan is formed by the three places of Jaisalmer, Bikaner, and Jodhpur out of which this location in Jaisalmer is the most famous compared to the sand dunes of the other two places. The staggering and incredible soul of Rajasthan and its culture can be experienced only by visiting the heart of the Thar Desert. The best way to indulge in the rawness of the desert would be to visit this amazing spot. Located quite away from the normal hustle of the population, the serene and calm desert is a really good place to unwind and get back in touch with nature.